While driving, one of the most important factors affecting driving safety considered excellent road visibility. It’s more important especially in winter. In the case of its deterioration, especially because of the snow, there is a chance to become the culprit of the accident or get into another unpleasant incident on the road. The main reason for poor visibility in this case will be the wrong selection of janitors for use in winter. In order for the windshield to be optimally clean in winter, especially during snowy weather or blizzards, it is necessary to purchase and install special winter wiper blades. They differ from conventional wipers in a more durable construction that contributes to a better and faster cleaning of the glass surface. Undoubtedly, wiper blades need to chose taking into account the time of year during which they will use. Why is this so important? For this, it is worthwhile to figure out what makes winter wipers different from summer ones. 1. Additionally, many models are equipped with a cover that protects against damage to the main elements of the wipers by snow or frost; it is made of rubber or plastic in the form of a frame. 2. Availability of additional technologies and functions. These include heating, which allows you to quickly and accurately clean the glass when the engine starts, prevents the brushes from freezing to the glass. 3. In the production of winter, wipers used special materials that have cold-resistant properties, so they do not crack even when operating in extreme cold. Thus, the use of these janitors will be more than effective – they will provide better protection, visibility and, accordingly, safety during the trip. An important criterion in the choice of janitors is the definition of what should be wiper blades – frame or frameless. Let's look at their features in more detail. 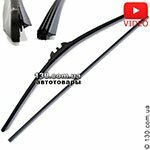 Winter frame wipers made with a frame that is located above the main mechanism; it protects all-important elements from falling on them of snow and water. In addition to the usual frame, which also have summer brushes, there is an additional winter cover. It has several fastenings, due to which the brush is very tight to the glass; as a result, it provides better cleaning of the glass surface. Installing these wipers on glass with a large slope will be impossible, and use – ineffective. Winter frameless wipers, many drivers almost do not perceive, as they consider them ineffective in use. However, this is not the case. When driving at high speed, when the glass exposed to strong airflows, the frame brushes find it difficult to cope with cleaning, and frameless brushes do the opposite. They are able quickly and accurately clean the glass, and a snug fit to the surface ensures good visibility on the road. Sometimes drivers use hybrid wiper blades for installation in winter. They also effectively remove snow and water from the windshield, providing excellent and effective cleaning. However, these wipers will have a much shorter service life, compared to winter options. Thus, we recommend buying both summer and winter wipers, and carrying out their timely replacement, depending on the time of year. It should be very careful and install the wipers for the season. After all, the use of summer brushes in winter can lead to their rapid wear – they can last no more than one winter. Regarding winter wipers, their service life is much longer – for everyday use, they will effectively clean glass for 3 years. You should also choose wipers for winter use carefully, because the quality and efficiency of their work depends on it. The choice is to stop on those options that suit exactly your make and model of car. At the time of purchase, it is worth knowing which cars the selected brushes are suitable for, to make sure that they really fit your vehicle. It is worth considering the fact that for cars of the same model, but with engines operating on different types of fuel, the wipers can also be different. 1. More quality cleaning the glass surface provide curved wipers, not straight. 2. The main rubber band for cleaning should be with flat and even edges. 3. On the packaging of devices should indicate that they are suitable for winter use and are made of frost-resistant materials. At the same time, these elements are divided into three types – ordinary winter wipers, frame with an additional protective cover and frameless. Ordinary winter wipers do not practically differ from summer ones externally; however, they are additionally equipped with thermal indicators that alert the driver about the need to turn on the heated glass. In order to ensure higher quality and long-lasting work of products, in them all the structural elements, which are made of metal, are replaced with analogs of plastic. Winter frame with additional covers protect all parts of the metal from moisture and snow on them. As a result, it contributes to better and more efficient cleaning, and prevents the appearance of corrosion on parts made of metal. Frameless winter wipers are equipped with straight brushes, not suitable for every vehicle; this should take into account when choosing. However, choosing a similar model for your car, you can appreciate the high quality and cleaning efficiency, especially while driving at high speed. For more optimal and efficient operation of the wiper blades in the winter, it is necessary to use them properly and take good care of them. This will ensure excellent cleaning quality and a longer service life. 1. You cannot tear the frozen brushes from the glass, as you can damage or rubber, or the janitor himself. It is necessary to warm the interior, after which they themselves separated from the glass. If the stove works well, it will take about 10-15 minutes. 2. Sometimes drivers use hot water for quicker release of frozen brushes – this is also not worth doing; after repeated use of this method, you can damage the windshield and make it more vulnerable. 3. When a sufficiently large layer of snow appears on the glass, it is necessary to clean it not by the wipers, as they will quickly fail, but with special brushes and scrapers having a rubber nozzle. It is important that if such a nozzle is missing, this may lead to scratches on the glass surface. 4. The elimination of heavy pollution should carry out with the use of special detergents. Their use will make cleaning the wipers faster and more efficient. It is important to use detergents designed for a particular season. 5. It not recommended mixing detergents for use in summer and winter, this will lead to the appearance of frost peel on the glass and damage to the winter wiper blades. 6. The occurrence of ice on the brushes is a very frequent phenomenon; therefore, it is necessary to eliminate it, not including the wipers. If you run them into work, it can lead to rapid breakdown. 7. It is necessary regularly inspect each brush for cracks and other damage to them. If any faults detected, it is necessary immediately eliminate them, this will help to significantly extend the period of using the janitors. 8. It not recommended raise the wipers and leave them in this position for a long time. In winter, this may cause the springs to frost up, in the summer – their premature failure. In any case, this method of preventing the freezing of brushes to glass may create new, equally serious problems that will lead to the breakage of these elements. 9. It is necessary to change the gum in a timely manner, since the use of worn tape leads to scratches on the glass, which, as a result, will cause chipping and cracks. Thus, you need to remembered of carefully pick up the winter wiper blades and take good care of them. Therefore, you can achieve a better and more effective cleaning of the windshield, improved visibility on the road, and more prolonged use of the wipers. Moreover, you can choose the best option for your car in our online store. Here is a huge range of necessary items and tools to ensure greater safety and visibility on the road during the trip. 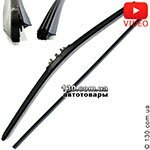 You can buy wipers in a car in Odessa, Kharkov and Kiev at 130.com.ua with delivery in Ukraine. Looking for a quality and the best janitors for cars? This rating of janitors for cars is made on the basis of such parameters as: high demand with positive feedback from our customers, high-quality manufacturing — absence of factory defects and service calls, and official warranty and post warranty support in Ukraine. The choice of janitors should be especially careful, because they are the guarantee of traffic safety. Pick up the janitors for the car quite simply according to the correspondence table presented in this article. Which car wipers are better to buy? Why do scratchers wipe the glass? How to eliminate the scrub wipers? Car wipers differ among themselves features of designs, a variety of fastenings, and also mechanisms of screen wipers. Therefore it is important to know how to implement the correct wipers for the car, because this is the most important part for the safety of traffic. Wiper blades are skeleton, winter, frameless, hybrid, all-season. Each of them has its own peculiarities of work, design, all of them in different ways cope with their tasks. On the example of products from the manufacturers Alca and Heyner, we will understand the main advantages of each type of models.